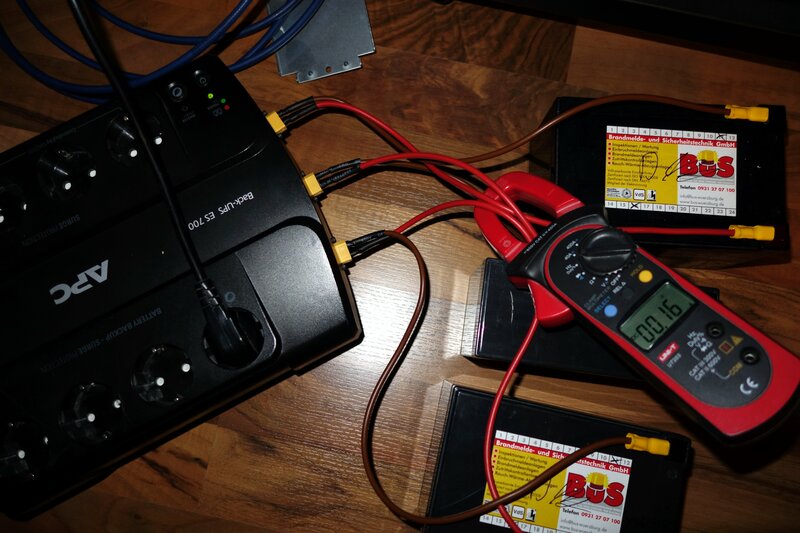 So the two puppies measured around 8Ah on 12A (1C) load, probably exceeding their specs as they are intended for long-term battery backups, not peak current. 2/3 of original capacity is no longer suitable for that task, but adding 16-ish amp hours is like a 175% expansion of battery capacity – not factoring in the lower current for each battery, likely increasing total usable capacity even more. These use the same flat faston connectors as the original system (larger ones use screw terminals), so adding those is exactly the same procedure as last year as adding the first external battery pack as described before. Conveniently, my file has the exact width required for the connectors, so those cutouts look better than before. 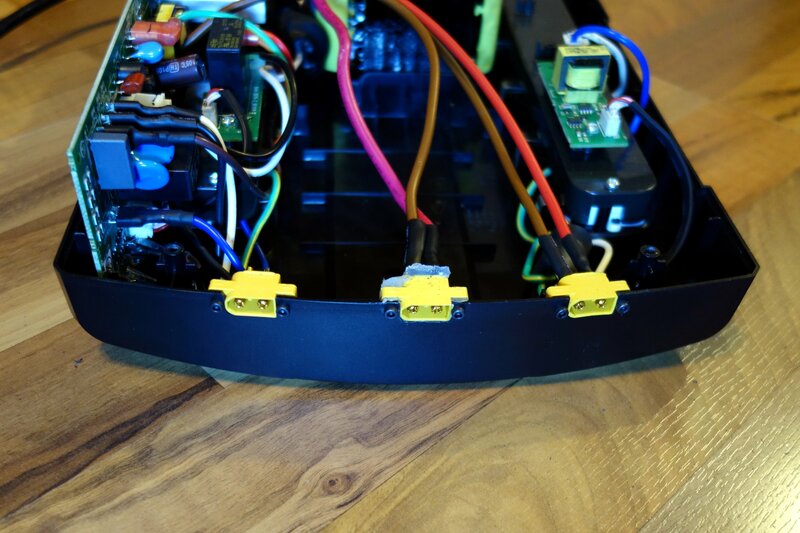 Spaced equally, not colliding with the internal PCBs and wiring, but requiring additional cuts to the battery molding of the bottom of the case. Anyway, this is everything connected and (trickle) charging – some folks on APC forums note that a fully depleted battery larger than the factory one could trigger UPSes into battery fail mode by a simple timing circuit. As this consumer UPS is pretty dumb and has no way of knowing a serial number, UUID or something of the battery, this would be resettable by a cold start, if that ever happens. Also, as charging current is pretty low even if the battery is flat, I don’t think this is a thermal issue long term. APC says this unit needs up to 16 hours to fully charge, most likely to discourage commercial use where this would be pretty devastating in case of a second power failure. This is the load test, running my desktop (FX-6300, 16GB DDR3-ECC, Radeon 380, one SSD, one 10GbE card, not much else) at peak load with Furmark. 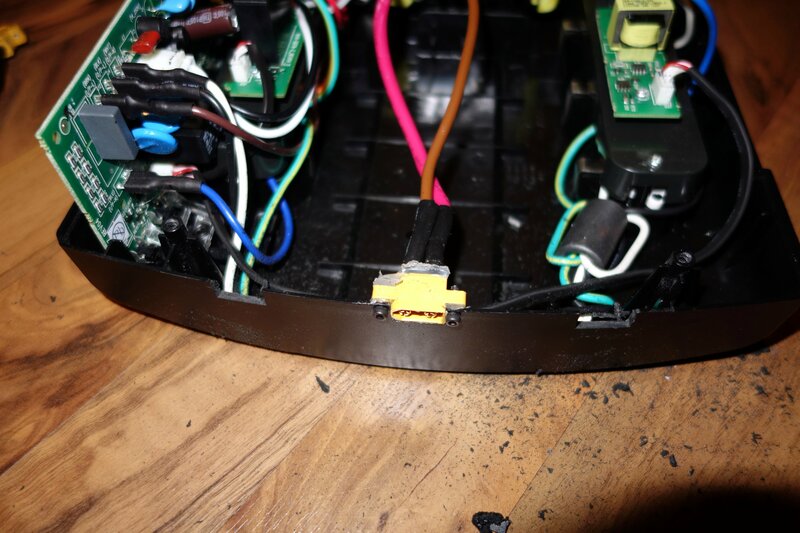 Display wasn’t attached to the UPS at that moment. 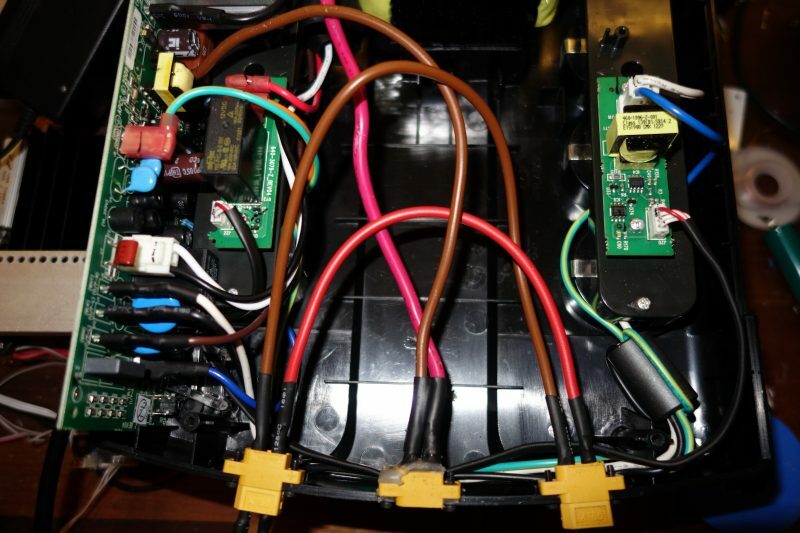 33A peak at I’d guess 11ish Volts would be 350ish Watts drawn from the batteries, which split current pretty evenly relative to their original capacity (12A/12A/9A). Massive improvement over drawing that from the poor single 9Ah cell! 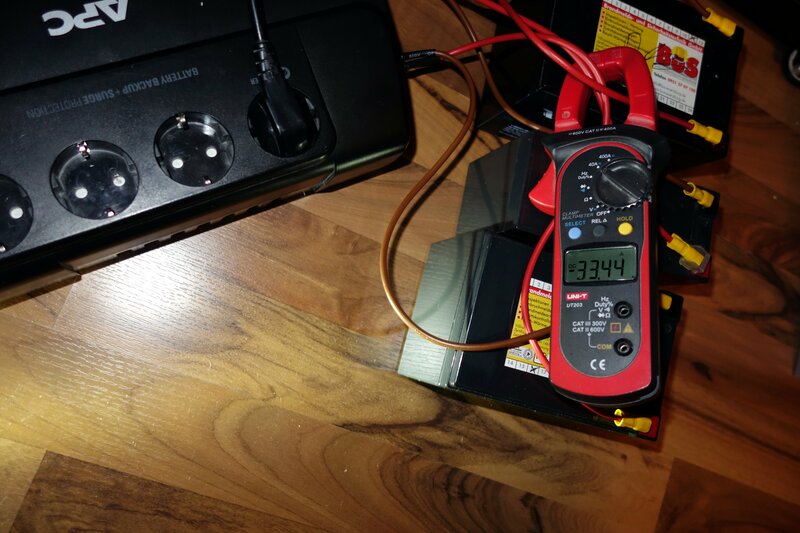 I’m aware that the extended capacity does not raise the thermal capacity of the UPS converter, even though the removal of the battery from the case could be slightly beneficial to that. But as I do not intend to run Furmark for the lulz when I’m not at home, I don’t see a problem with sub-50W loads over extended periods of time. “Das muss das Boot abkönnen” (the vessel’s gotta put up with that), as the famous quote of Das Boot suggests. Actually, just tomorrow will be a planned outage for 2 hours, so I’ll see how that system fares.